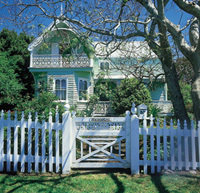 Built in 1885-6, Meroogal is a 5 bedroom timber house with "Gothic" trimmings. Four generations of women from the Thorburn family have occupied the house. Their daily routines, domestic chores and the pursuit of genteel interests have left indelible marks on the house. Meroogal, with its intact collection of furniture and furnishings allows visitors a personal insight into the private world of a single family. Portable ramp access to main house, large print guides, education services. The collection includes furniture, household objects, diaries, letters, scrapbooks, photographs and clothes, allowing a very personal insight into the private world.